Here you can read a short portrait from the “Grund Genug Magazine” (09/2018). Click on your preferred language to download the PDF File. THE BUCKET LIST FACILITATOR was founded in Hamburg. As service provider it is specialized in the fulfillment of personal, individual desires and events. We help our reputable and challenging clientele to realize their bucket list. The essential basis of our work is trustfulness and sensibility for our clients’ needs (interests). After all you are sharing your very special desires with us, which requires not only trustful handling but especially reliability and discretion. 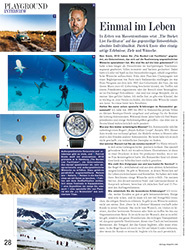 THE BUCKET LIST FACILITATOR was launched by Patrick Enste, a merchant (businessman) from Hamburg. It dates back to 2005 that the work within the upscale branch of tourism has become his passion. As enthusiastic service provider it is very important for him to perceive the people’s desires and needs and make them happen. It is a matter of course for him to always act honestly, fair and trustworthy on behalf of his clientele. References of his previous activities can be found in international magazines like “VOGUE”, “USA Today” and “New York Times” as well as exclusive travel magazines such as “Travel+Leisure” and “Town&Country Travel”. Some well-known persons from the Forbes billionaires-list are among his clients. We look forward to working with you and help realizing an unforgettable “Once in a Lifetime” moment making your desire come true! Please get in touch.